$9 or $10 for 3 Sesame Street Books w/ CDs + Free Shipping! UPDATE: Use code easy2 at checkout to take off another $2.00! 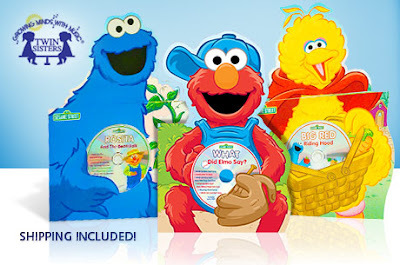 Head over to EverSave and you can get 3 Sesame Street board books with audio CDs for as low as $9! The deal is on sale for $12, but new Eversave members will get a $1 credit, making it just $11. Use code easy2 to make it only $9! The books will automatically be shipped to the address you provide a checkout, so you don't have to worry about redeeming or waiting for a voucher! Titles include Rosita & and the Beanstalk, Big Red Riding Hood and What Did Elmo Say? Makes a great gift for your budding reader!